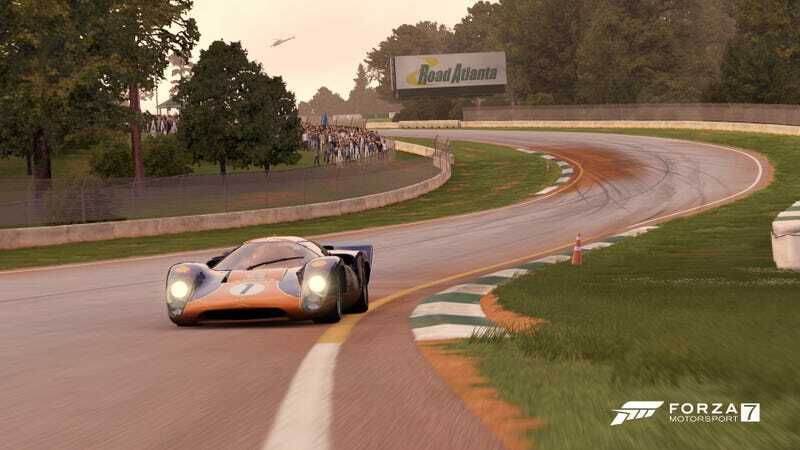 The tenth round of the Oppositelock Forza 7 Endurance Championship, at Road Atlanta is Sunday, November 4th at 4:30 PM EST. If you’d like to learn more about the series, click the link and get all the info. Or, if you’ve already read the plan but haven’t signed up yet, click here to go straight to the sign up sheet. Votes are in! Now, due to scheduling conflicts on my end that require me moving mountains to make OEC happen on the winning choice, I am going to have to overrule the voting and go with the next best option from the voting, which means the race will be held on Sunday, November 4th, at 4:30 PM EST. NOTE THE SWITCH FROM EDT TO EST, since this will be after the clock switch. Sorry for overruling the vote, but I didn’t have much choice here. On the bright side, we’re gonna have a nice break leading up to the race, which gives plenty of time for practice and BoP. AT THE TIME OF THIS WRITING, BoP IS NOT COMPLETE. You can follow BoP changes here. Any builds that change will be highlighted, and I will provide a full list of cars that have been given new builds once the BoP process is done. I’m not sure when BoP will begin as my wheel is currently down. New parts are being shipped though, so hopefully soon. And remember this is an endurance round, so this race will be 2 hours instead of 1.5. Practice accordingly.